TRAIN Law: A Pop or Flop? Based on the World Bank Global Findex (2014) estimates, only 31.3 percent of the Filipino adults have formal accounts. According to it, the usual barriers include financial costs, insufficiency of funds, lack of documentary requirements and perceived low utility of a bank account, among others. 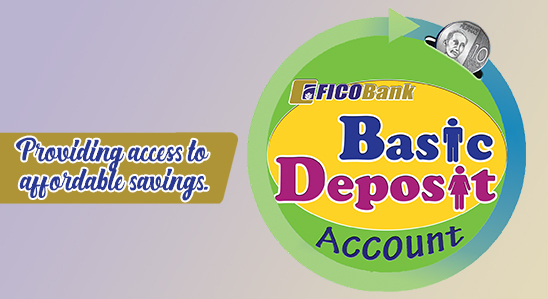 In compliance with the said BSP Circular, and in furtherance of its Financial Inclusion Program, FICOBank has come up with its own Basic Deposit Account (BDA). The unbanked community folk can now start and stay on saving in an affordable and accessible manner. The Basic Deposit Account of the Bank, with liberalized customer-onboarding procedures, provides every unserved and underserved person the opportunity to save. The salient features of the Bank’s BDA include: (i) simplified know-your-customer (KYC) requirements; (ii) opening amount of Php50.00 but not more than Php100.00; (iii) no minimum maintaining balance and dormancy charges; and (iv) maximum deposit balance of Php50,000.00. These key features meet the need of the unbanked individuals for a low-cost and no-frills deposit account, which they can open even if they do not have the standard identification documents. The FICOBank’s BDA also supports the implementation of the National Retail Payments System (NRPS) that aims to increase the adoption of digital payments in the country. Through the Nationlink-Coop Banks Network Alliance, or NATIONLINK-CBNA for short, the previously unbanked people will soon be able to participate in the digital finance ecosystem and benefit from the electronic fund transfers for their remittance and payment needs. The Basic Deposit Account of FICOBank is expected to provide the much needed boost in helping expand the formal bank account ownership and usage in the country.